wx-config-win is a tiny implementation of wx-config for Windows compilers. 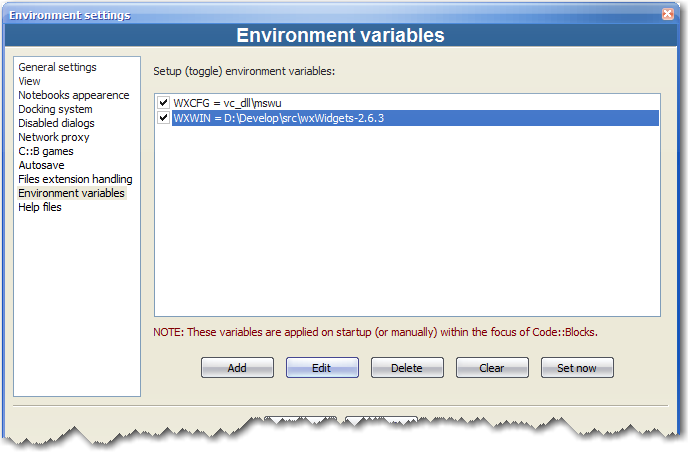 wx-config is a helper tool used when compiling applications that makes use of the wxWidgets library. values on where to find wxWidgets and it's configurations (monolithic, debug, unicode, wxuniversal, etc). Note that backticks is a property of the shell or the build system used. Fortunately the Code::Blocks IDE supports backticks natively on windows. For other Windows IDEs and build systems there are workarounds, commonly using response files. When compiling wxWidgets apps between Linux and Windows (the Code::Blocks projects are almost the same between Linux and Windows, so it's less maintenance). When compiling wxWidgets apps in Windows but wanting to use any configuration and any compiler supported (in Code::Blocks only MinGW MONOLITHIC builds are supported by the wizard). This port gives support for MinGW, VC, and DMars, and for every possible wxWidgets configuration (NON-MONOLITHIC, DEBUG, UNICODE, UNIVERSAL, etc). Linux developers can feel at home. Copy wx-config.exe to anywhere in your path. Go to Start menu->Control Panel->System->Advanced->Environment Variables and there click New, setting Variable name to WXWIN and Variable value to where you have wxWidgets installed (ie. C:\wxWidgets2.6.3). Launch Code::Blocks. Go to Settings->Environment->Environment variables and there click Add, setting Key to WXWIN and Value to where you have wxWidgets installed (ie. C:\wxWidgets2.6.3). If you have only one configuration, it will be autodetected (including the compiler used). If you have more than one, you can use wx-config --wxcfg=gcc_dll\mswu for example, or set an env. var. like WXCFG=gcc_dll\mswu for choosing the configuration you want. 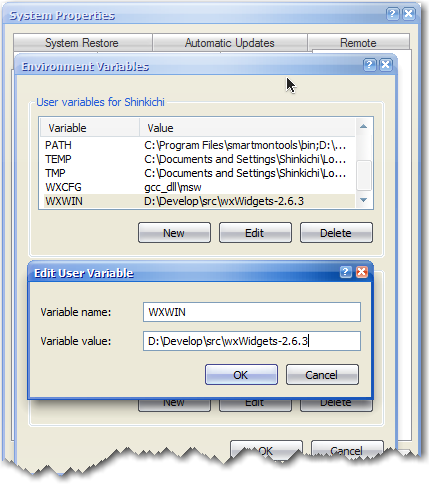 Path of the wxWidgets installation (ie. C:\wxWidgets2.6.3). Relative path of the build.cfg file (ie. gcc_dll\mswud). Outputs all pre-processor and compiler flags. Same as --cflags but for C++. Uses a debug configuration if found. Uses an unicode configuration if found. Uses a static configuration if found. Uses an universal configuration if found. Outputs the wxWidgets release number. Outputs the name of the C compiler. Outputs the name of the C++ compiler. Outputs the revision of wx-config.